One possible explanation is an emerging school of thought that a US recession/quasi-recession is actually good for the dollar. According to the proponents of this theory, weak/negative US growth is both damaging to the rest of the world and a catalyst to encourage US investors to bring money back home. The upshot is that there is less demand for foreign assets/currencies and more demand for US assets/currency; hence, the dollar rallies. The dollar picked up steam back in December once the thesis that the world economy could “decouple” from the woes of the US fell apart — it became clear that the BRIC economies are less equipped to deal with fallout from the credit crisis, and are more likely to default on their own debts. As stated above, this led investors to unwind their investments in emerging markets, and bring them back into US cash (a more liquid asset). Since stocks were tanking, coupled with the Federal Reserve’s intent to suppress interest rates with its various liquidity programs (TARP, TALF), many investors sought safety and bought US bonds — to at least yield some sort of return while on the sidelines. Since March 9th (the recent bottom in equities), there has been a departure from risk aversion, and more investors have sought the same risk they did last summer in commodities and emerging markets. China’s renminbi is ascending but not suitable for parking the world’s reserve assets because there is no bond market there. Moreover, the renminbi is not yet widely used for commerce and in contracts. Well, Tony may have spoken too soon. Brazil and China will work towards using their own currencies in trade transactions rather than the US dollar, according to Brazil’s central bank and aides to Luiz Inácio Lula da Silva, Brazil’s president. An official at Brazil’s central bank stressed that talks were at an early stage. He also said that what was under discussion was not a currency swap of the kind China recently agreed with Argentina and which the US had agreed with several countries, including Brazil. The scale of the agreement wouldn’t be enough to dramatically affect the FX markets, but it could if this idea appeals to other foreign countries. Brazil has discussed selling 10 and 30 year bonds in International markets this year, which would add to the currency’s liquidity…which satisfies another trait of a desirable currency. As many of the world’s economies embrace foreign investment (Malaysia’s FX market is currently closed to outsiders, for example), and as our domestic economy releverages money from this period of zero interest, the dollar may wear a frown sooner than expected. Naked short-selling can save a trader the costs of borrowing shares, or can make it possible to short a stock where borrowing is very difficult because so many others want to sell it short. A large number of fails does not prove naked short-selling, since there are other reasons for trades to fail, but such a number does indicate it is likely. It looks like the trading arena is on the road to recovery. There’s an ideology developing where the SEC should tax trades to depress volatility — which would probably put a lot of people out of work. Such a tax could make the markets better. Financial markets raise capital for new enterprises. They help people exchange assets and information. But just because there is higher volume doesn’t mean these trades are expressing more views. Instead, all that is happening is that the bandwagon is speeding up. The faster it goes, the more people want to get on. 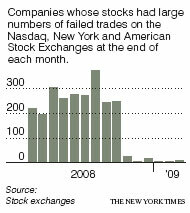 Noise traders drive out the fundamental investors. The full article brings up some good points.